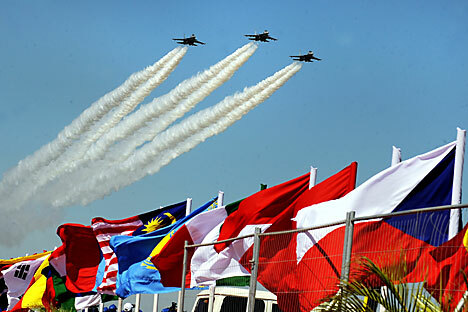 The air show and demonstration of Indian pilots’ prowess at the Aero India 2011 held in Bangalore in February highlighted Russian aircrafts’ role in India. More than half of the planes that took part had been developed and built in Russia or in India under a Russian license. India sees cooperation with Russia as a high priority. The Russian multipurpose SU-30 MKI fighter jet is known as “India’s pride”. Hindustan Aeronautics Limited’s management considers the building of these planes under a license, along with the development and building of their own LCA fighter plane, to be its most successful project. The implementation continues of a massive project (270 planes worth $12 billion) which is the most successful military technical deal between Russia and India: SU-30 MKI (customized) continue to be delivered regularly. According to the head of the United Aircraft Building Corporation and the head of the companies MIG and Sukhoi Mikhail Pogosyan, the Indian market can absorb at least 200 more SU-30 MKI planes. “We constantly modernise the planes,” stresses Mr Pogosyan. Our modernisation priorities are avionics, radar and other systems, and increasing the plane’s capacity to strike ground and air targets. The most massive modernisation of onboard weaponry is in adjusting the BrahMos missile to be used by these planes. Another successful project is the programme for creating a family of BrahMos supersonic missiles (so named after two great rivers, the Brahmaputra and Moskva). By now IAF missiles of the “ship to ship”, “ship to shore”, “shore to ship” and “surface to surface” class have been tested and put into service. The first to be adopted was the Block I version of BrahMos, which is an anti-ship missile that can also be effective against onshore radio-contrast targets. Then, at the request of the Indian strategic weapons command, the Block II variant was developed which features an improved control system, self-targeting warhead and software, a receiver of satellite navigation system signals and can neutralize both radio-contrast and ordinary ground targets. Work on the basic versions of BrahMos was largely completed in 2009 and 2010 and they are already in use by the Indian Navy and Strategic Forces. Further work involves improving the missile and building air and submarine-launched missiles. Experts at BrahMos Aero Space Limited have created an updated modification, Block III, which can strike targets while swooping down vertically. The missile is meant for rugged terrains, for example, when the target is hidden behind a mountain or mountain range. Another BrahMos cruise missile modification, intended for submarines, has already been tested, including from a submersible stand. The problem is that there is yet no carrier, and the only option under consideration is a non-nuclear submarine, since Mr Pillei ruled out the use of BrahMos cruise missiles by nuclear submarines. Indian experts engaged in building up the Indian Air Force today focus on a tender for 126 multi-role combat aircraft (MMRCA) worth at least $10 billion. The previous Aero India exhibition witnessed what amounted to a latent competition during the course of a demonstration programme involving the Russian MIG-35, the American F-16 and F-18 Super Hornet, the French Rafale, the European Eurofighter and the Swedish Gripen. This time around, however, the MIG-35 was absent, causing raised eyebrows and even disappointment among local experts. There has even been speculation that “the Russians have dropped out of the race for a prestigious piece of the pie”. The Indian Defense Minister A.K. Antony told a press conference in Bangalore that the choice of aircraft after the tender will be made “for the good of the country” and not on the basis of preference for any country or pressure from any bidder. The final decision, the Minister said, will probably be made in the next fiscal year and prior to submitting documents to the Indian Government they will be studied by a technical commission set up to agree upon the price parameters. It is indeed an ambitious programme and, as HAL Corporation managers said at a press conference, it would require about $6 billion for research and development alone. The bulk of the work will be carried out by a joint working group in 2011 and the result will be submitted to the customer, the Indian Air Force, in the first half of 2012.